Bell Helicopter, a Textron Inc. (NYSE: TXT) company, announces that, should the Bell 407GXi be selected for the U.S. Navy Advanced Helicopter Trainer program, the company plans to conduct final assembly of the aircraft in Ozark, AL. Bell submitted its proposal to the Navy on April 2. The Navy is seeking to acquire 130 aircraft. Helicopter Market on the Rebound! 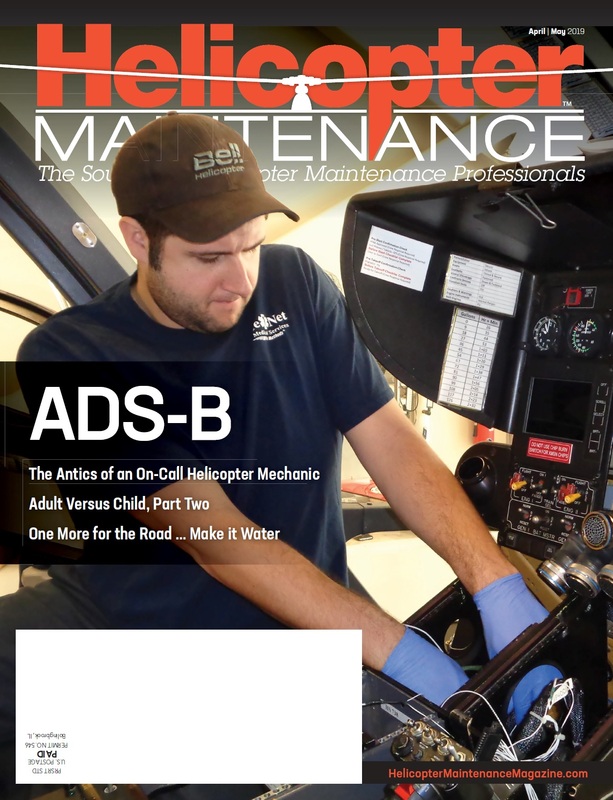 At Helicopter Maintenance magazine, we remain optimistic about the future of the helicopter industry. So much so that we are ending the year with our first ever attendance at a European helicopter trade show! Click the cover to access the digital issue. Leonardo announces that Aerocardal Limitada has been appointed an Authorised Service Centre for its helicopters in Chile. The announcement was made during an official ceremony held at FIDAE 2018. Under the agreement, Aerocardal Limitada will provide comprehensive support and maintenance services from its base at Comodoro Arturo Merino Benítez international Airport, for Chilean owners and operators of AW109 light twin-engine and AW119 single-engine helicopters. DART Aerospace is prepared for FIDAE Airshow 2018, the biggest aerospace, defense and security exhibition in Latin America. DART Aerospace is focused on setting a strong presence in the multiple countries of Latin America and has been attending a wide variety of aerospace shows and exhibitions within this region in order to showcase top-selling products and solutions adapted to operators’ needs. The Federal Aviation Administration will host the 2018 International Rotorcraft Safety Conference featuring approximately 35 presentations and seminars in an effort to reduce the national helicopter accident rate, particularly among small operators. The three-day event will offer inspection authorization and FAA AMT and WINGS credits. Admission will be free. Qatar selects Safran Helicopter Engines as engine supplier of its new NH90 fleet. The 28 NH90 military helicopters, whose acquisition was announced on March 14, will all feature RTM322 engines. They will be assembled in Bordes (France) and delivered to Airbus Helicopters’ facility in Marignane, where the NH90 tactical transport version (TTH) is assembled, and to the Leonardo Venice-Tessera facility in Northern Italy for integration with the naval (NFH) configuration. Safran Helicopter Engines now powers 80 % of the worldwide NH90 fleet. RUAG Aviation expands the scope of its EASA Part 21 J Design Organization Approval (DOA) to include night vision imaging system (NVIS) capabilities. The specification of NVIS technical field entitles the aviation life cycle support and services provider to directly classify and approve changes and repairs, to design and develop supplemental type certificates (STCs) for aircraft with NVIS configurations, and to integrate new NVIS to existing platforms. Librestream announces that Safran Helicopter Engines has successfully deployed a remote video technical assistance service using the Onsight collaborative platform. Safran Helicopter Engines first announced this innovative Expert link branded service at the HAI Heli-Expo February 28 in conjunction with Heli Austria, Rotortech Services, Inc., and Heligo, first customers of this new service. After analyzing dozens of helicopter accidents that resulted in fatalities for pilots and passengers, the U.S. Helicopter Safety Team ( www.USHST.org ) has determined that the further development and wider usage of these four flight technologies will improve safety across the helicopter industry and save lives. FlightSafety International announces a new leadership workshop designed specifically for flight department personnel. Leadership Elements for Flight Department Professionals was developed in conjunction with ServiceElements. At HAI Heli-Expo, Safran Helicopter Engines is launching Expert link, a new video assistance service, and announcing the first customers: Heli Austria, Rotortech Services Inc., and Heligo. This new service allows the customer to connect with Safran Helicopter Engines experts through a secure, live video feed to facilitate technical diagnosis or guide them through a maintenance task. Leonardo announces further combined orders for helicopters at Heli-Expo in Las Vegas for a total of 17 aircraft valued at almost 140 million euro for several customers in various countries and for a range of commercial and public service applications. Contracts include a mix of AW119Kx single engine, AW109 GrandNew and AW109 Trekker light twins, AW169 light-intermediate, AW139 intermediate and AW189 super medium types, confirming the strong competitiveness of the company’s modern product portfolio.